Both the male and female are identified by a grey crest, grey top feathers, black forehead patch, white breast and belly with a buff color patch at it's flanks. Juveniles will lack the black forehead and buff flank under the wing. Adult birds are about 6" in length. Identification is rather easy seeing how no other small bird in New York has a grey crest. Nesting is done in the holes of trees, usually cavities made by woodpeckers. The nesting holes can be found lined with animal hair gathered from live animals such as raccoons, opposums, house pets and other fur bearing creatures. Adult pairs can be seen year round as males and females mate for life. Breeding occurs around April & May. Females lay 5-6 finely brown speckled, white eggs that incubate for about two weeks (12-14 days). After hatching, young birds may stay with their parents long enough to help with the following years nesting before leaving. 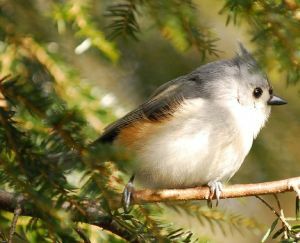 Titmice, like many birds, help trees and other plants spread by pooping out seeds in new locations. During the winter the they will forage in flocks with Chickadees, Nuthatches, and Woodpeckers. Dominant over the Black-Capped Chickadee, Chickadee populations will usually drop when Titmice expand into their territory. Most live their entire life within a few miles of their birthplace. These are curious birds and not shy about approaching humans. They can even be persuaded to feed from ones hand.